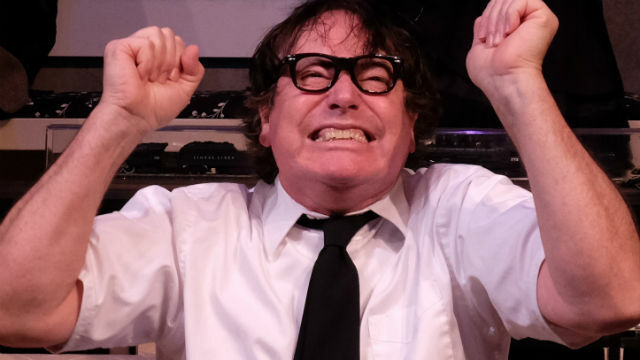 David Heath in “The Nerd” at Lamb’s Players Theatre in Coronado. If somebody saved your life, you’d be beholden to him, right? But just how far would that obligation go? Beyond where his intrusions have caused you to lose a crucial business contract and exasperated your friends beyond endurance? And how far will said friends go to help you out of an unbearable situation? These are the questions posed by Larry Shue’s 1981 comedy, “The Nerd.” But the show isn’t as deep as these queries might suggest. In fact, things get pretty slapstick-silly. But that’s exactly as intended. And it’s a sheer joy to watch the inimitable David Heath inhabit the terminally inept and unwelcome guest, Rick Steadman. I saw him play the role about 25 years ago at Lamb’s Players Theatre (it was so popular, and Heath was so beloved, that the company produced the show three times in the 1990s). I’m happy to say that his performance has’t lost any of its squirm-inducing punch. Heath is much-missed on the Lamb’s stage; he always brings such honesty and credibility to every role — no matter how outlandish. Heath was terrific in Shue’s other, better, comic invention, “The Foreigner.” Those are the playwright’s best-known works. “The Nerd” was his first full-length play (he even appeared in the original production at Milwaukee Rep). But four years later, he died in a plane crash, at age 39. So, good ole Rick Steadman pays a visit to successful-but-socially-stuck milquetoast architect Willum Cubbert. The two men were together in ‘Nam, and Rick did indeed save Willum’s life — but Willum was unconscious the whole time, and they both shipped out before the pair could actually meet. Rick arrives and disrupts Willum’s life, work and sanity. How he and his friends (one of whom, Tansy, would like to be a whole lot more) cope with and finally get rid of Rick is the comic centerpiece of the play, involving cottage, cheese, mud and marauding pigs. The nutty work was originally set in Terre Haute, Indiana in 1979, but the Lamb’s program note says “Twenty years ago.” That would be the 1990s, counting back from today. But nothing about the current production bespeaks that era — even if Tansy admits that she, Willum and Axel (the jaded, cynical, one-liner-spewing theater critic) are “old-fashioned.” These folks don’t seem to know what pantyhose or portable phones are. Willum’s house doesn’t look like an architect’s typically high-concept home. The clothes are not ‘90s either — nor is the incidental music. Under Robert Smyth’s direction, the cast is quite good all around. Brian Mackey, as Axel, gets all the best lines — and delivers them with snap and crackle. Cynthia Gerber is solid as Tansy, and Susan Clausen does well with the small role of a mousy, schoolmarmish closet plate-smasher. As her wealthy, pompous husband (much better attired than she is), John Rosen is just right, though perhaps he yells and bellows a bit more than necessary. As their bratty son, Scotty Atienza seemed hoarse the night I was there, and couldn’t scream as much or well as his character demanded. Mike Buckley is the calmly disintegrating center of the action — and this visit does finally light a much-needed fire under him. It’s hard to tell which is the bigger nerd: the guest or the host. Though you certainly wouldn’t want him camping out on your couch, Heath’s, character — with his hilariously awkward face, body and social interactions — is endlessly watchable onstage. Performances are Tuesday-Thursday-Saturday at 7:30 p.m., Friday-Saturday at 8 p.m., Saturday at 4 p.m. and Sunday at 2 p.m.
Pat Launer is a long-time San Diego arts writer and an Emmy Award-winning theater critic. An archive of her previews and reviews can be found at www.patteproductions.com.